Anyone have updates from the community meeting? I'll be putting together a piece on this next week. I'll be holding off until the latest feedback is incorporated into the plans. Will massing models/studies be part of your report to enquiring minds? 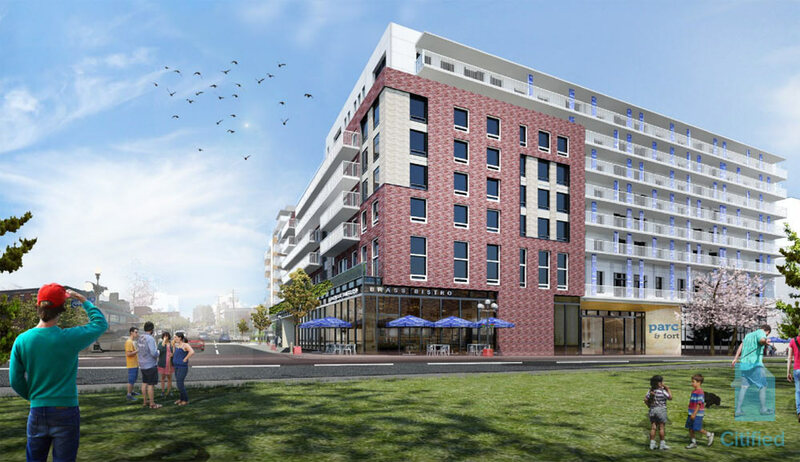 Very curious about the height and massing, since PARC's recently approved development in White Rock will be 22 storeys with 204 units, on a ~3,320 sq.m. site. This site is bigger, but the height difference is drastic! I think this is currently the "million dollar mystery". How will so many units be squeezed into this building without creating a monolithic, 10-storey, L-shaped slab? 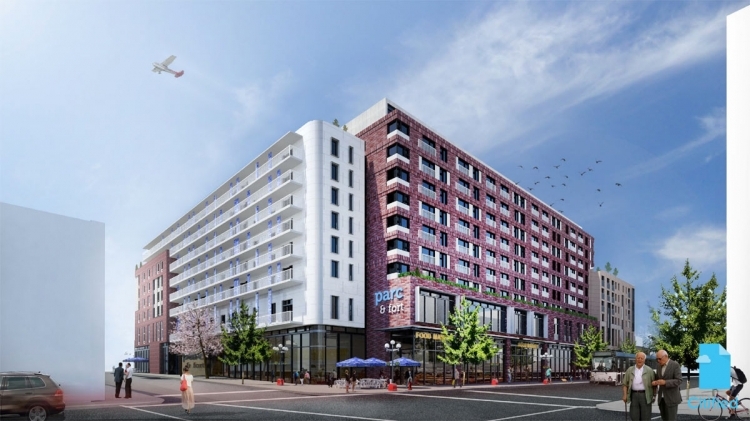 An artist's rendering of Fort & Parc, a mixed-use purpose-built seniors rental and commercial development that is envisioned for eight parcels along the 800-blocks of Fort and Broughton streets at Quadra Street. This rendering depicts the building's Quadra Street frontage as seen from Pioneer Square. 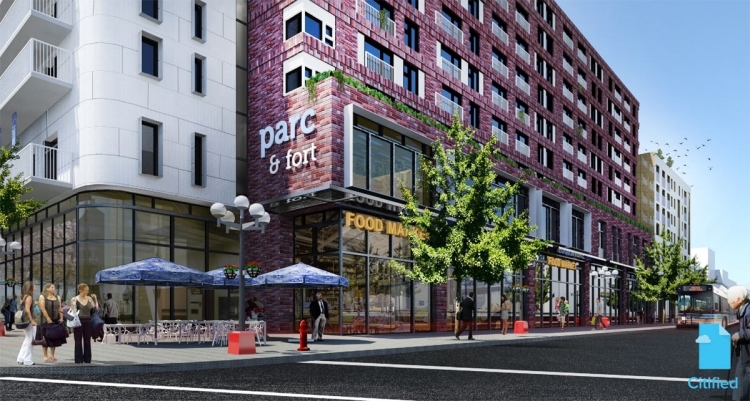 Vancouver-based Parc Retirement Living has proposed a sizeable mixed-use rental and ground floor commercial building that could see hundreds of seniors apartments, licensed childcare facilities and a boutique grocery store built along Fort Street’s Antique Row. Set to occupy eight parcels in the 800-blocks of Fort and Broughton streets, the cascading complex – expected to contain 254-units of seniors rental housing and 20-units of non-age-restricted workforce apartments – will rise six-storeys mid-way along the 800-block of Fort Street and 10-storeys along the eastern-most quarter of the block at Quadra Street. A north-south wing spanning the entirety of the 1000-block of Quadra Street will step down from ten-storeys to nine, while frontage along Broughton Street will decrease to six-storeys and culminate in a single-storey adjacent to the newly completed Escher on Broughton condominium tower. If it's a seniors residence, why are all the people in the rendering young? Edited by FirstTimeHomeCrier, 29 March 2017 - 09:49 AM. Just as suspected - it's hideous. ps: are they tearing down the buildings across Fort Street to build that green space? Edited by Nparker, 29 March 2017 - 09:59 AM. We're looking at the corner of Quadra and Broughton, from Pioneer Square. Not a fan of the brick going up six storeys - it should be reserved for horizontal massing, not vertical. The street wall is a little imposing, but with Pioneer Square across the street I can see the rationale. It's not awful, but definitely needs some work. I mistook the rendering for the Fort Street frontage. Somehow that seemed reasonable based on the name. Funny, the vertical brick is the only part I like. It breaks up those horribly long, horizontal, "1960s motel balconies". And even the name is dumb, implying an intersection of Fort with some nonexistent "Parc" street. I guess "The Parc @ Fort" made too much sense. I stand by my initial assessment. Send this one back to the drawing board. Gag. Almost looks like a Super 8 if you take away the brick. Seems it needs a corner entrance badly. A visual focus point that faces the amazing neighbours--Pioneer Square and the church. MCMP should know this from the work they did on the Juliet. It just lacks personality. * There's nothing distinctive about it. * How about a curved corner? * How about breaking up those long balconies a bit and maybe doing something with them to make them look less ordinary? You guys are right, that "motel" vibe is never a good thing. The ground floor running along Broughton looks like it might be pretty good. And I appreciate the effort to stagger the heights of the various wings as described in the article. I don't know... it just bugs me that large projects are happening on key sites but overall design seems to be going backwards. And it bugs me that the the city's design panel always seems to miss the most glaring issues. Edited by aastra, 29 March 2017 - 02:29 PM. My understanding is there will be a main set back entrance at Fort and Quadra. There are more visuals on the Citified profile. I actually like the commercial space on the corner. Tall windows. It seems like it would work. That's like saying you like a car because of the tires. "Solid. Nice and black." There are more visuals on the Citified profile. I'm thinking some of those images might have been useful in this discussion thread. Yeah, but when we're talking about the best way to take advantage of a view or a potential view we don't need to complicate matters. Big windows right on the corner. Places for people to sit and eat and do stuff. It'll work wonderfully 98% of the time. Edited by aastra, 29 March 2017 - 11:08 AM. Hopefully Mike won't mind. The Fort Street facade is definitely better than Quadra. The motel balconies are unredeemable.